Better known for Sonic the Hedgehog and Super Mario Bros than for No-Limit Holdem, console game giants Sega have announced their entry into the competitive world of online poker. Launching their site on the established iPoker network, collectively the 3rd largest pool of poker players online, means that the software back-end is run by playtech – limiting the amount of animation and feature changes possible. 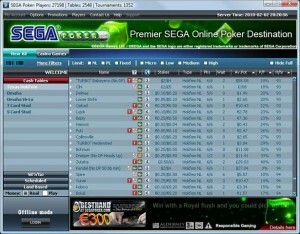 While those expecting a Sega all-action experience at the tables may be disappointed, the lively branding is instantly recognizable from the first time you see the Sega Poker website. Sega Poker is not currently available in US and Japan, two of this company’s key markets. Industry insiders have suggested that Sega are joining casino giant Harrah’s in growing their poker offering and experience in anticipation of a future regulated market in the US. With huge potential for marketing to their existing console-gaming fans, it is also possible that Sega could benefit from a lower ‘cost per acquisition’ for players than rival sites. In addition to giving this company a head-start in the competitive poker industry, the iPoker Network may also benefit from the large influx of inexperienced players – who could keep the games profitable for those with poker strategy knowledge. Players of all experience levels can take advantage of the launch of this new poker room – with Sega currently offering a 200% match on your first deposit, plus additional bonuses totaling a huge € or £ 2010. Check out Sega Poker now to take full advantage of their initial promotions, sega poker bonus and launch offers! This entry was posted on Wednesday, February 3rd, 2010 at 5:20 am and is filed under Poker Industry News. You can follow any responses to this entry through the RSS 2.0 feed. You can leave a response, or trackback from your own site.